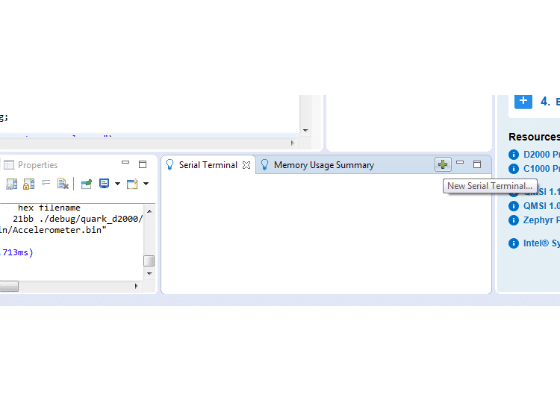 Intel® System Studio for Microcontrollers includes multiple samples to help you get up to speed with its basic functionality and become familiar with the Intel® Quark™ Microcontroller Software Interface (Intel® QMSI). 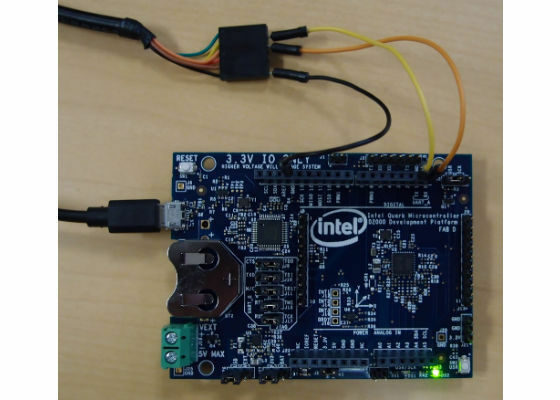 This sample application reads and outputs accelerometer data to the serial port, and also uses the Intel® Integrated Performance Primitives for Microcontrollers (DSP functions) library to compute root mean square, variance, and mean for the last 15 Z axis readings. FTDI cable (model TTL-232R-3V3 works well) for serial output. You can purchase an FTDI cable or find out more about them here: http://www.ftdichip.com/Products/Cables/USBTTLSerial.htm. Links at the top of that page let you download drivers for the FTDI cable, if needed. Connect GND (black) from the serial cable to the board's GND pin. Connect TXD (orange) from the serial cable to the board's RX pin. Connect RXD (yellow) from the serial cable to the board's TX pin. 2. 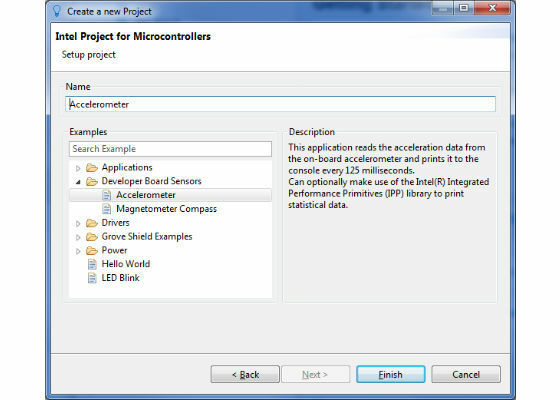 Launch the Intel ® System Studio for Microcontrollers IDE. 1. From the File menu, select New, and then select Intel Project for Microcontrollers. The Create a new Project wizard appears. 5. Set up the Serial Terminal view to see the sensor output. This window will display the accelerometer's sensor data via the UART interface over the serial cable. 1. At the bottom right of the window, select the Serial Terminal tab, and click the icon to open a new serial terminal connection. 2. Ensure that the correct serial port is selected. You can also click the Custom configuration menu to modify the default serial connection settings. 1. Unplug the FTDI cable from your PC and refresh the “Open Serial Terminal” window to determine which COM port is active. 2. Linux*: Use the ‘dmesg’ command to view your port status. 3. Windows*: Open Device Manager to view the Ports (COM & LPT) status. 4. Click OK and the connection to the Serial Terminal will be made. You should see status “Connected” in the serial console. 6. Build and deploy your project. Note: you can also deploy and debug. From the Debug drop-down list, select "Accelerometer (flashing)". 1. Select the "Accelerometer" project in the Project Explorer. 2. Click the Build button to compile your project. 3. From the Run drop-down list, select "Accelerometer (flashing)". 4. View X, Y, and Z values from the accelerometer in the terminal. The accelerometer sample uses the onboard Bosch BMC150 accelerometer connected to the microcontroller using the I2C interface, and the RTC (real time clock) integrated in Intel® Quark™ microcontroller. It also uses the integrated UART module for the data output over serial port. This configuration enables the RTC alarm, and sets accel_callback as the callback function for the RTC alarm. It is used to periodically print accelerometer data. The cfs.pos parameter is used to configure the accelerometer address for the BMC150 accelerometer. The Intel® Quark™ Microcontroller D2000 Developer Kit board has a jumper that allows changing the address. The BMC150_J14_POS_0 is the default (no jumper, I2C address 0x10) configuration. Each time the 125-millisecond interval is reached and the RTC alarm is triggered, the following accel_callback function is invoked. The accel data structure defined at the start of the function is passed into the bmx1xx_read_accel function, which populates it with the current accelerometer data read. If this read is successful, the accelerometer data is printed to the serial console output; otherwise, an error message is printed. The callback function checks whether the defined number of samples have been read; if not, the RTC alarm is reset and the count is incremented, otherwise the complete variable is set to true. Note that by default, the application reads 500 samples (NUM_SAMPLES) before exiting. Finally, when the complete variable is set to true, the while loop exits and the applications prints a final statement to the serial console output, and exits. The Intel® Integrated Performance Primitives for Microcontrollers library is a set of building blocks for signal and data processing applications for x86-based microcontrollers. 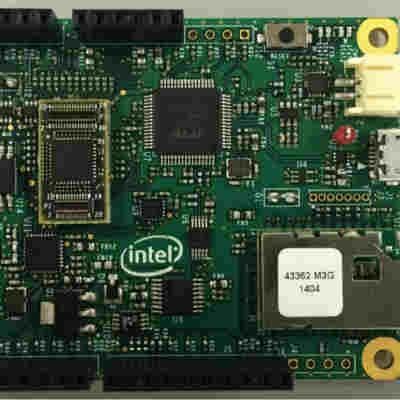 Intel® IPP is available with an Intel® IPP classic-style API and a generic DSP-style API; this application is developed with the DSP-style API to demonstrate the usage of Intel® IPP for Microcontrollers in a DSP use case. Additional information on Intel® IPP can be found in the Intel® System Studio for Microcontrollers User and Reference Guide. The print_axis_stats function uses the Intel IPP (Intel® Integrated Performance Primitives) library to print the statistics of the last 15 (set by NUM_SAMPLES) Z axis readings. * QMSI Accelerometer app example. * once it has read 500 samples. * variance and mean of the last 15 samples each time. Exact difference between Microcontroller and Microprocessor?